Pencil produces a different kind of portrait to oil. They are soft, wistful and a little bit romantic in nature. While they are quite three-dimensional, they have a dreamy quality to them that is unique to graphite and they make outstanding portraits in their own right. Pencil portraits come with mat frame and backing board, ready to go straight into a frame. Like the oils, the portrait is drawn up using a grid system. However, I do pencil portraits bit by bit, completing each section as I go, rather than laying down several complete layers. As you can see from above, I do lay down a base shading, and then start building up the pencil layers from there. In the final stage the background is added, and the fur will be fluffed out into the background. Generally for pencils, as there is so much detail already, I will keep the background as simple as possible so it doesn't pull the focus away from the subject. For my pencil work, my favourite paper would be Fabriano 5. It is a beautiful paper to work on and comes smooth and textured. For light portraits I will use the more textured paper, and for dark, I use smooth, as it can be difficult to lay down a sold dark colour on textured paper. I use a variety of pencils - Staedtler would be my favourite, but I also use Derwent, Faber Castelle and Carbon Pencils for the dense black. I am also about to trial Cretacolor!. I have a favourite soft cloth for smudging, smudgsticks that I tip the end with soft rubber for back drawing, cotton tips, and most importantly, my electric eraser. That is absolutely invaluable for back drawing light fur detail! At the beginning of a portrait, it starts off very neat and contained. As you can see by the end, I generally have a collection next to me of the pencils I use the most. I quite often will use two or three brands of the same weight pencil, as they all draw slightly differently. I dont generally go under a 3H though, and for blacks, I use carbon. 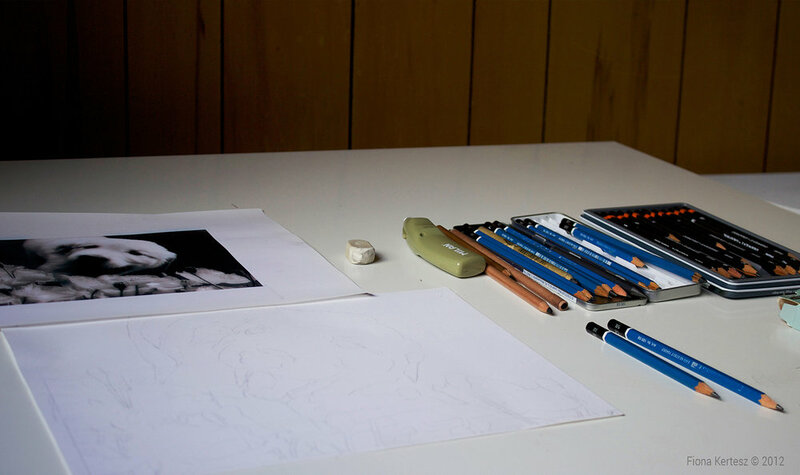 It creates a much denser black, without the graphite sheen that comes with softer pencils. I have a page dedicated to photography tips, but I also wanted to mention the types of photos that are suited for pencil drawings. As there is a lot of fur detail in a drawing, the clear, sharp photos make the best portraits. These are excellent examples, as I can see all details clearly and there is great fur definition around the face. This one however, I wouldnt recommend as a pencil. I cant see the eyes clearly, and its slightly fuzzy. The water would create too much texture and detract from the subject. However, as mentioned in my oil page, it would make an excellent oil portrait (actually, its on my list to do). Have a look at my photography tips page for more photos and tips!